1. 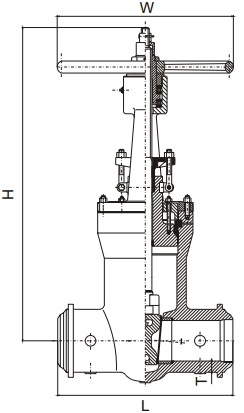 Technical drawing of pressure seal gate valve. Technical drawing for pressure seal gate valve, G.A drawing. optional gear operator, Yoke & Bonnet structure for sizes 4" and smaller, RF and RTJ connections. 2. Dimensions & Weight Specification. NPS in. 2" 2-1/2" 3" 4" 5" 6" 8" 10" 12" 14" 16" 18" 20" 24"
NPS in. 2" 2-1/2" 3" 4" 6" 8" 10" 12" 14" 16" 18" 20" 24"
See more specification of pressure seal gate valve.